At the end of the spring semester, I had the opportunity to attend and present my work at this year’s Conference of the Latin American Studies Association in New York City. The meeting brought thousands of specialists of Latin America to the Big Apple’s Midtown Hilton and Sheraton Times Square hotels. I landed in JFK on Thursday late afternoon and took an Uber into the city. Checking into my hotel in the West Village that evening, I made it to the conference site at the start of the next day. Already the Hilton lobby was packed with attendees for a full schedule of panels and other events over Memorial Day Weekend. In total, more than six thousand people participated in this year’s LASA with over 1,400 panels listed in the program. The conference’s film festival also screened dozens of works. Bustling Times Square, photo by author. For historians of the U.S.-Mexico Borderlands, there were a handful of interesting bilingual panels presenting papers on mobility, immigration policy, cultural and social analysis, drug policy, and historical memory of the region. On Friday morning, Amelia A. Hall of the University of Alberta was scheduled to give her paper, “The Badasses of Bad Movies: Border Hybridity, Women’s Models, and Gendered National Identity in Cine Fronterizo.” Unfortunately, it was difficult make it to everything given that a lot of related panels were occurring at the same time. Down the hall, Marta M. Caminero-Santangelo, of the University of Kansas, had organized a panel on literary depictions of border crossings, which looked at the DREAMers, as well as the Caribbean context of the border (Marisel C Moreno, University of Notre Dame), and Latinx literary aesthetics (Ylce Irizarry). Of course, being New York City in springtime, there were countless things to do outside the hotel’s walls. Walking through midtown Manhattan, people wearing their attendee badges could be seen enjoying all that the area had to offer. 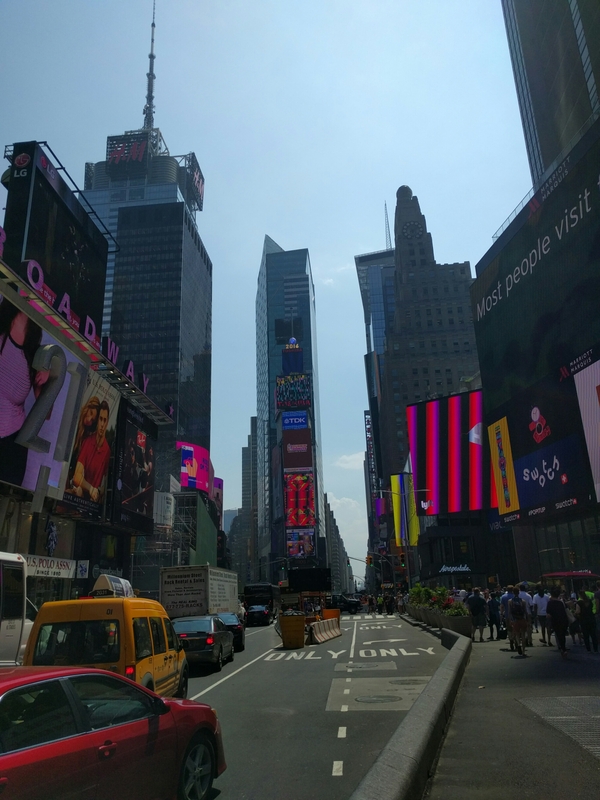 Although the heat was sweltering, I joined friends for walks in Central Park, strolled Fifth Avenue, and later had dinner nearby the conference at the tasty and affordable, Topaz Thai. The next day, I was excited to attend an early evening panel organized by Stanford University’s Mateo J. Carillo, and chaired by Julia G. Young of the Catholic University of America, on transnational migrant mobilities. Being an historian of transport mobility in northern Mexico, myself, this session was right up my alley (pun intended). The first presenter, Laura D. Gutierrez from the University of California-San Diego, spoke on the history of the Bracero program and punitive deportations. One aspect of the work that really captivated my interest was Gutierrez’s analysis of the power and limits of the U.S. and Mexican bureaucracies that exerted power over transnational workers. Following Gutierrez, Carillo spoke about the history of road building in the Bajío, a northwest-central region of Mexico, and its impact on the mobilization of agricultural workers who traveled for jobs in the United States. Carillo rightly emphasized that new roads played a crucial role in this labor history from the 1940s to the 1960s. Lastly, Yuridia Ramirez of Duke University, presented her work on the links that form between Mexican migrant communities in North Carolina and their families and friends remaining in the Bajío. She analyzed themes of identity production and cultural heritage, and the role that education played. The discussion that followed was lively. Afterwards, I joined colleagues for dinner at the aptly named House of Brews. My panel, organized by my friend and colleague Catherine Vézina of the Centro de Investigación y Docencia Económicas (CIDE), was scheduled for Monday morning in the Times Square Sheraton. It began with José Alberto Moreno Chávez of El Colegio de México (Colmex) who spoke about cosmopolitan culture and modernization in Mexico City through a fascinating analysis of how elites wrote and thought about popular terms, including “Snob” and “Fresa,” which invariably included historical context of U.S. cultural influence. I followed with a presentation on rural road-building campaigns in Mexico, including the northern Mexican state of Nuevo León, where transportation companies pressed the government for more highways in support of domestic and U.S. tourism along the border. Catherine continued, giving a paper on the implications of the bracero program to bilateral policy initiatives and questioning the impact on modernization schemes in Mexico. After her, Valeria Sánchez Michel, also of CIDE, discussed the history of modernization related to Mexican higher education in the 1950s, exploring the cultural representations that planners hoped to impose as well as how this ideal contrasted with students’ everyday life and demand for reforms. Finally, Colmex’s Vanni Pettina concluded the panel with a lively discussion of his work on bilateral relations between the Soviet Union and Mexico during the late 1950s and early 1960s as Mexican President Adolfo Lopéz Mateos navigated the diplomatic currents of the Cold War. Following the panel, it was time to grab a coffee, check into some other sessions, meet more friends and colleagues, and later explore more of the city. The weekend was packed and like any LASA conference, it’s hard to make it to every panel and event that piques your interest. Nevertheless, it was a great experience that brought together a wide gathering of the academic community on Latin America in a diverse, multicultural and multidisciplinary atmosphere. If you were at LASA this year, share your experiences about the panels (especially borderlands-themed sessions) in the comments below!